For the fifth consecutive year, Design Master Software has conducted a survey of engineers and designers in the MEP industry about whether or not they are using building information modeling (BIM) on their projects. This article describes the results we found this year and compares them to the results from previous years. The survey was conducted online. A link to the survey was included in our monthly newsletter, on various LinkedIn groups, on Autodesk’s AutoCAD MEP forum, and on AUGI’s Revit MEP forum. Results from the survey in 2010, 2011, 2012, and 2013 are available online. The most notable result about this year’s survey is how little has changed in five years. The number of people using BIM for various purposes is the same. The number of projects using 3D collision detection is the same. 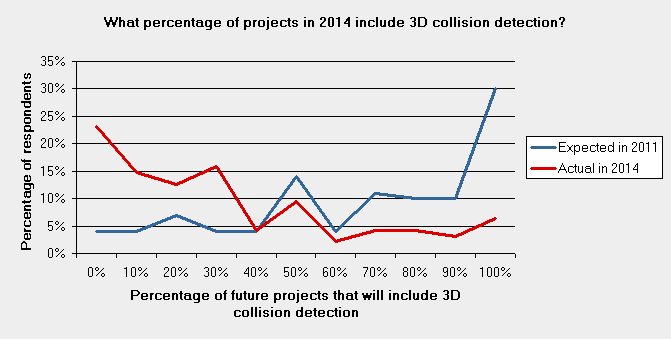 There is a slight decrease in the expectation of the use of 3D collision detection on projects in the future. In previous years we assumed that asking about 3D collision detection was a reasonable proxy for whether a project used BIM or not. We added questions this year to evaluate whether that was true or not. We were surprised to find that 3D collision detection and BIM were not as interchangeable as we thought. Next year we plan to add questions to explore what engineers use BIM for when they do not use it for 3D collision detection. This year, 103 people responded to the survey, 75 of whom were located in the United States or Canada. 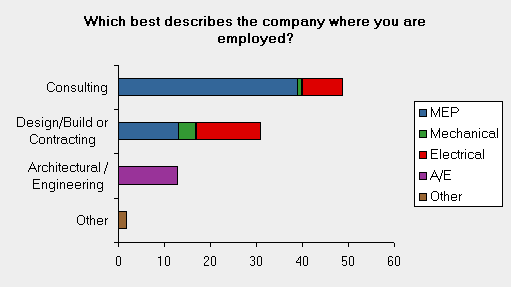 Like last year, most of the respondents worked at consulting companies and at large companies. We asked which BIM programs the respondents use. 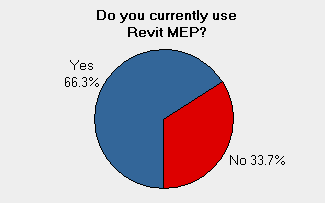 Two-thirds of the respondents in the survey use Revit MEP. 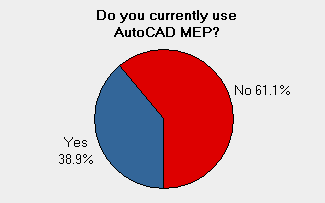 Less than half use AutoCAD MEP, which is down compared to last year. Half use Design Master HVAC, Electrical, or Plumbing. There was significant overlap between the three programs, with many respondents using a combination of two or three of the programs. Due to the fact that we sponsored the survey and advertised it in our monthly newsletter, the number of DM users relative to the industry as a whole is overstated. BIM and 3D are not the same thing. You can use BIM for many other purposes, such as automated design, material takeoffs, and green design. We wanted to know how the various types of BIM were being used on projects, not just 3D collision detection (3D-BIM). Comparing the various years, there has not been much change in the use of BIM for different purposes. 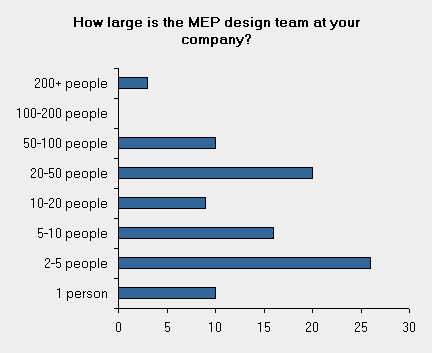 We asked what percentage of current projects the respondents work on use 3D-BIM. The graph can be a little confusing to read at first. 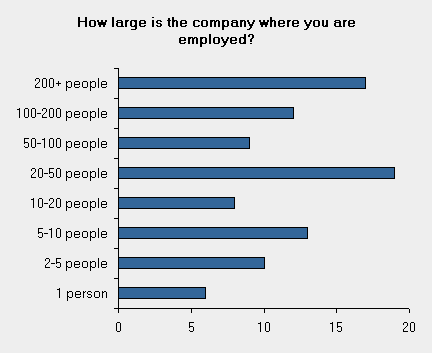 The x-axis is the answer the survey respondent gave to the question. The y-axis is the number of respondents who gave that answer. 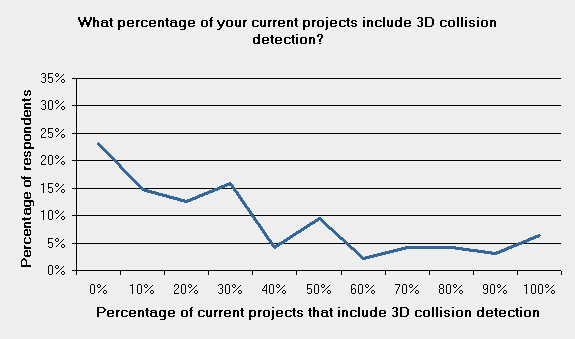 For example, at the far left of the graph, 23% of respondents use 3D collision detection on none of their projects. 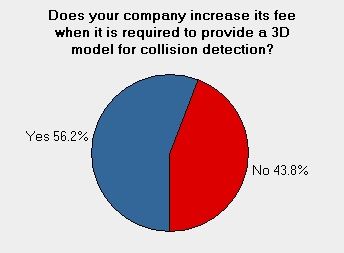 At the far right, 6% of respondents use 3D collision detection on all of their projects. Comparing this year with previous years, the shape of the graph has not changed. The use of 3D collision detection in 2014 is basically the same as in 2010. Creating a 3D model and coordinating it with other disciplines is a time-consuming process. We asked whether firms are able to charge for the additional time required on projects that use 3D-BIM. This number continues to bounce around 50% each year. This year it is 56%. In 2010 it was 40%, in 2011 it was 56%, in 2012 it was 49%, and in 2013 it was 46%. We also asked what percentage of projects in three years would be designed using 3D-BIM. Respondents expect to use less 3D-BIM in the future this year than they expected in past years. The number of respondents who anticipate that no projects will use 3D-BIM in the future has increased from 4% in the past to 14% this year (shown on the far left side of the graph). The number of respondents who anticipate all projects will use 3D-BIM in the future has decreased from around 30% to 17% (shown on the far right side of the graph). Using data from our survey in 2011, we can compare the prediction of 3D-BIM use with the actual use. Far fewer projects this year use 3D-BIM than people predicted in 2011. We found this same result last year when comparing the prediction from 2010 with the actual use in 2013. We have used 3D collision detection as a proxy for BIM in our surveys. We chose this question because it is very simple to answer. It is clear whether a project used 3D collision detection or not. Whether or not a project used BIM is a more complicated question. This year, we asked about the correlation between projects that used 3D collision detection and that used BIM. We wanted to know what the overlap looked like. 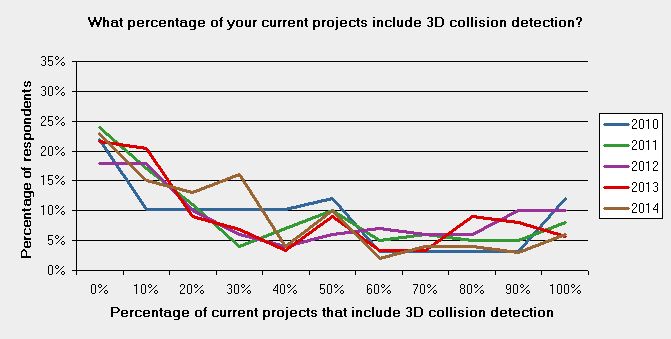 Most projects that include 3D collision detection use BIM, though not as frequently as we expected. 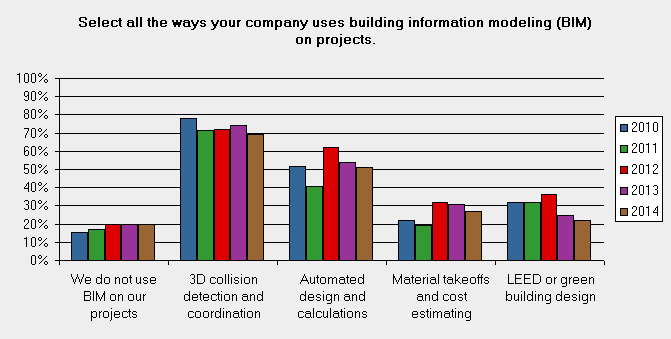 For 71% of respondents, all their projects that include 3D collision detection use BIM. In general, when someone says they included 3D collision detection on a project, it is likely they also used BIM. The opposite was not true. For 54% of respondents, some of the projects they did with BIM did not include 3D collision detection. This result was surprising. In our conversations with engineers, BIM and 3D collision detection seemed nearly synonymous. In reality, there are lots of engineers who use BIM on projects that do not include 3D collision detection. Each of these results brings up a different question. For the 29% of respondents who include 3D collision detection on a project without using BIM–what are they using for their 3D modeling? What kind of 3D model are they creating that does not qualify as BIM? While an interesting question, we do not plan to pursue it in the future. We want to track the use of BIM in the industry, not the use of 3D modeling. For the 54% of respondents who use BIM but do not include 3D collision detection on a project–what are they using BIM for? Next year we plan to ask additional questions to try to provide answers to this. We asked about some of this already (see the Type of BIM Used section at the top of the article). Respondents use BIM for automated design, material takeoffs, and green design. There are also a variety of other answers that have been filled in under Other. We will expand our questions to get more details about what they use BIM for and how many projects they use it on. If there is additional information you would like to know about the use of BIM in the MEP industry, let us know in the comments. We will try to incorporate the feedback we get into next year’s survey. After five years of surveys, the only response that has changed in our surveys is the expectation of using 3D collision detection in the future. The actual use of 3D collision detection specifically, and BIM in general, has not changed. Next year we will begin looking at what people are using BIM for on their projects. Thanks, good survey and interesting/surprising results. If you read ENR in 2010, you would have assumed the AEC world would be dominated by BIM users in 2014-2015, but clearly not the case and not expected. I would be interested in your opinion as to why this is so. Also, do you have any regional breakdown of your survey respondents (West Coast, Rocky Mtn, Mid West, East Coast)? Thanks again, Mike Peters RA Esq. I don’t have a breakdown based upon region in the US. I really don’t see the point in making BIM files and not using some form of clash detetion in the MEP disciplines/trades. It’s like designing an HVAC system, then sending it out for fabrication only to pay for something that does not work. So how much money do you think is being thrown away with this idea?